Why not join us for a Summer Picnic at Burrs Country Park? The event will take place in July or August depending on the weather. We will give you 48 hours notice of what day it will be. Society members go free and guides pay £2. Please call the Society on 0161 763 7014 and leave your name and number and we will contact you nearer the time. The Annual Summer Outing for the members of the Bury Society for Blind and Partially Sighted People is to Millstones at Harrogate on Wednesday 26 August 2009. The fourth year in which our supporters and volunteers have provided a Gift Wrapping Service in the Millgate Centre proved to be the most successful yet ! Led by Beth Rogan and Yvonne Wright, our team of nearly 100 volunteers (including many newcomers to the Society) were “on duty” every day from December 7th to Christmas Eve. They wrapped over 4,500 presents for the people of Bury and raised a staggering £4,700 for Society funds. In the last few days before Christmas we also had teams of “bag-packers” in Marks and Spencer – an addition £1,000 being raised. Our thanks are due to everyone who took part and supported as well as to The Millgate Centre and Marks and Spencer for their hospitality and to the local Shops who helped with donations of wrapping paper, ribbons and trimmings. We are having a Focus day at the Society whereby two companies Optelec and Dolphin will be demonstrating equipment. This includes video magnifiers that enlarge information onto a screen to enable everyday activities such as reading, writing and viewing pictures. Guide software will also be demonstrated. This is a computer package, that has its in-built screen reader, so it will read out the text on the screen, even while you are typing. It also has its own in-built screen magnifier, so you can enlarge the text on the screen, while you are writing a letter or surfing the internet. The demonstration takes place at the Resource Centre 36 Bolton Street from 11 am to 3 pm. So why not come along and just have a look and a play with the equipment and see whether it could be of help to you. It would be great to meet up! Unfortunately due to circumstances beyond our control the sponsored Morecambe Bay Walk had to be cancelled. Cedric Robinson MBE had to make the decision on Friday 28th August that, due to health and safety issues, the walk could not take place. We are in the process of organising another sponsored event in the near future as a replacement for the Morecambe Bay Walk, so watch this space and we will let you have further information as soon as possible. We are holding a Race Night on 14 August 2009 at Walshaw Sports Club, Sycamore Road, Tottington. Tickets cost £7.50 which includes the price of a hot meal. There are prizes and raffles and all proceeds go to Bury Society for Blind and Partially Sighted People. Tickets are available from the Resource Centre, 36 Bolton Street Bury. Under Starter's Orders 7pm for 7.30 pm. Please join us. Update: We are thrilled to announce this evening raised over £300 for the Society and was enjoyed by all who attended! Rossendale Ladies Choir is holding a charity concert in aid of Bury Society for Blind and Partially Sighted People on Wednesday 11th March at 7:30pm. The concert will be held at Bury Parish Church, The Rock, Bury. Tickets for the event are priced at £6.00 each and are available from the Society Resource Centre, 36 Bolton Street, Bury. For more information please ring 0161 763 7014. Brand new Society website launched! It gives me great pleasure to welcome you to the new website of Bury Society For Blind And Partially Sighted People. The website has been expanded and updated and now includes more information about services offered by the Society and also the agencies that the Society works with. I hope that you find the website useful and interesting. Should you have any ideas or suggestions to make please contact staff at the Society. With this new website, the Society aims to reach a wider audience, raising awareness of our work for blind and partially sighted people. We also expect existing clients to use this platform as another way to access information, news and support. We wish to give a big thank you to Paul Gregory for all his hard work in creating our website. We would love to hear your thoughts and suggestions about the website. Your feedback is crucial for helping us to develop a high quality and useful resource. Please send your comments to enquiries@buryblindsociety.org or contact us using our usual contact details. Hi everyone, just a quick note to say a great big thank you to all our volunteers who did a fantastic job helping out with the Society’s Gift Wrapping Service. This is held each year in Bury’s Millgate Shopping Centre. This year we reached our target of £3000 and went over that by £300. Well done. The Society can’t function without all our volunteers and so I hope that you enjoyed our thank you party which we held on 16th January. Our next function is a Grand Charity Concert to be held at Bury Parish Church on Wednesday 11th March at 7.30pm. 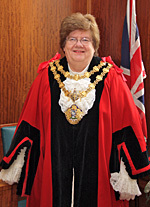 We are pleased to say that the concert is by Rossendale Ladies Choir with Soloist Soprano Janet Lancaster. Our very own Diane Trigg (resource centre receptionist) is a member of the choir and we all look forward to hearing her sing. On the 23rd July fifteen dedicated volunteers took part in a money laundering count held at the Trafford Centre. The proceeds of the Dolphin Fountain were kindly provided by the Trafford Centre with volunteers managing to raise over an incredible fifteen hundred pounds which went towards the charities much needed resources. Thank you very much to all our volunteers who kindly offered their support. 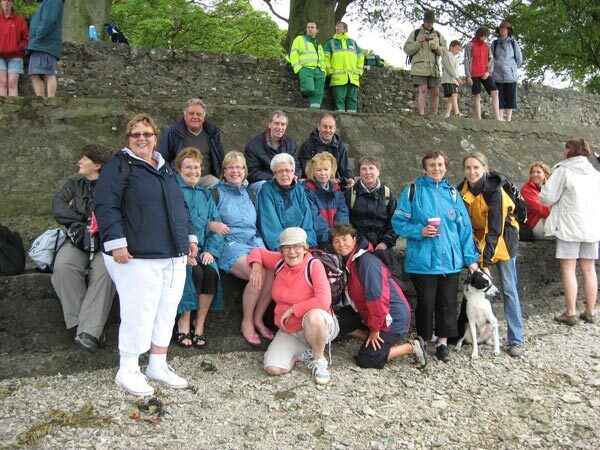 The society has arranged another Morecambe Bay Walk this year. It's on August Bank Holiday Sunday 30th August 2009 at 2.00pm. The walk will of course be organised and undertaken by the Queen's Guide Cedric Robinson MBE. All visually impaired people who would like to come with us will be accompanied by a fully sighted volunteer. After the successful walk last year we do hope that you will be able to join us. We have a wonderful team of volunteers who, on a regular basis throughout the year rattle collecting tins at various public locations across Bury. Their efforts in 2009 were rewarded with takings of over £5,000. Very grateful thanks to Alan Norman who heads up the team and all those who’ve helped during the year.